(1) Preheat the oven to 400°F. Take your pie crust out of the fridge and allow it to come to room temperature. (2) Heat 2 tbsp of olive oil on high in a nonstick pan and add the crushed garlic to the hot oil. Move the garlic all over the pan allowing it to evenly brown. Add the chopped onion and bell pepper to the pan. Lightly season the vegetables with salt. Saute on medium-high heat for about 5-8 minutes. Remove from heat. 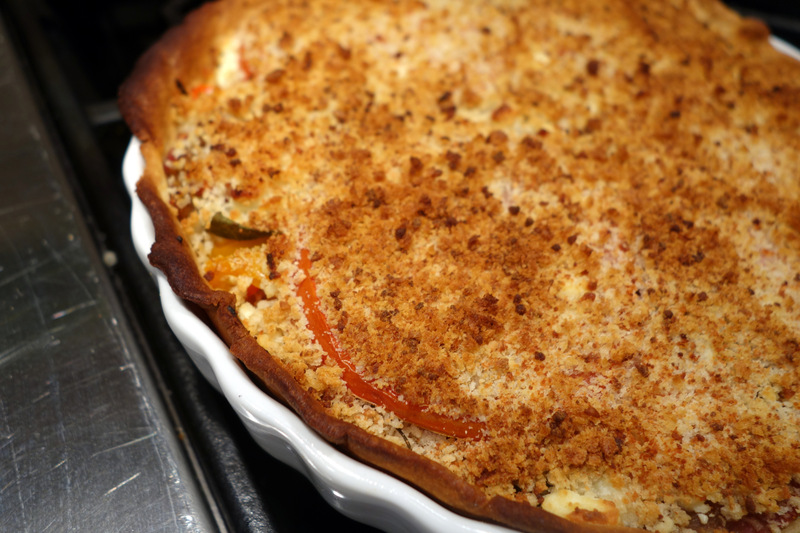 (3) Line a pie dish with your pie crust. Arrange an overlapping layer of tomatoes on the bottom. (I arrange all but 4 large tomato slices and 3 kumato slices on the bottom and save the rest for the top layer.) Lightly sprinkle with salt. In a small bowl combine 1 tbsp Dijon mustard with 1 tbsp olive oil. Drizzle and spread the mustard and olive oil mix over the bottom layer of tomatoes. Sprinkle a layer of goat cheese over the tomatoes. (4) Add all the onion and pepper saute to the pie. Spread it out evenly. Next add a layer of basil leaves. Sprinkle another layer of goat cheese over the basil. Arrange the remainder of the tomato slices next. Lightly salt the tomatoes. (5) Add any remaining goat cheese crumbles over the tomatoes. Combine the Panko breadcrumbs and the Parmesan cheese in a bowl. 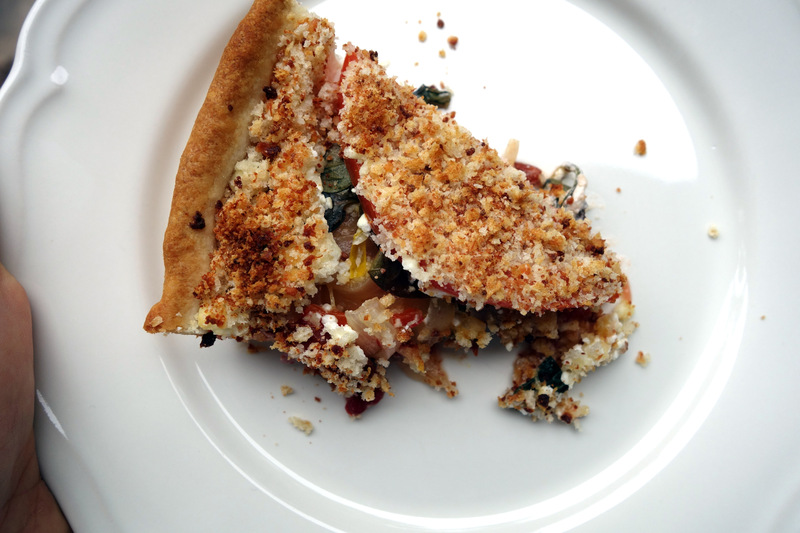 Cover the pie with all the breadcrumb and Parmesan mix. (6) Bake at 400°F for 25-30 minutes. Let the pie cool down for 10-15 minutes before serving. This entry was posted on September 12, 2015 by natalyaperullo in Uncategorized.